Looks like tvN is at it again. Anyone heard of this new upcoming drama, Surplus Princess? It’s a kicky coming of age drama with a mermaid who hates anyone who is unemployed. Um. Okay. No. I’m sorry, no. That is not okay. What the fudge kind of premise is that? A mermaid who hates anyone who is unemployed? Oh, and the only way she can become full-on human is to get a full time job herself? Why does a mermaid need a job? Prices skyrocketing on those shell bras? You know, I didn’t actually hate Nail Shop Paris. I thought it was light, breezy fun. Well, until the cool guy turned into the obsessive boyfriend–oh–and you know, she turned into a guhimo and they pulled a Boys Over Flowers with the whole love vs soul mate cheat. Then I got cranky, very cranky. tvN, when you have it right (and you have it right a lot of the time) you are very, very right. But when you are wrong? Shudder. Of course I say this as I’m currently looking forward to High School King of Savy, a drama with a plot that involves a high school hockey star living a double life as his older brother as an executive while hunting down the people who were responsible for his parents deaths. So maybe Surplus Princess will turn out to be awesome. 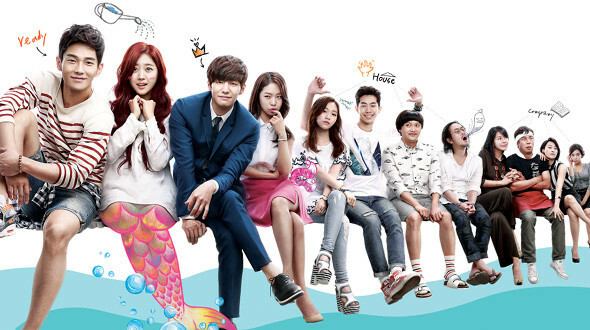 They already have a cast of Jo Boa as our mermaid, who was previously on Shut Up Flower Boy Band. You know what, she was actually pretty serviceable there. The hero will be On Joo Wan, who I’ve never seen in anything, but was most recently in the usually disliked Sword and Petal. Our B Lead will be Song Jae Rim. Woot, Song Jae Rim! Except, he was the lead in Nail Shop Paris. Here’s hoping he grows his hair out for this drama. Maybe he could suddenly be revealed as a mer-man and his hair can magically grow. If there is any man who should always rock the luscious man-locks, it is Song Jae Rim. I’m going to step back from this drama for a while, before I seriously hurt myself from the eye rolls. But it’s nice to know I’m not completely tvN biased. All Surrounded Part 10: What Happened That Night!